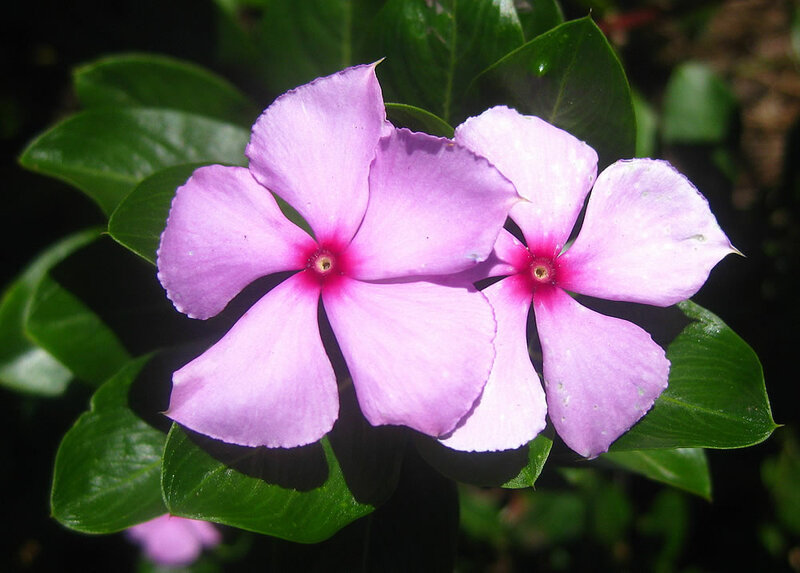 Distribution and habitat: Catharanthus roseus is an evergreen shrubs or herbaceous plant, sprawling along the ground or standing erect to 1m (3 feet) in height, native and endemic to Madagascar where its natural habitat was almost been lost. It was found growing on sand and limestone soils in woodland, forest, grassland and disturbed areas. This herb is now common worldwide as ornamental plant. It is naturalized in most tropical and subtropical regions being escaped from cultivation, spreading in rocky outcrops and roadsides in dry savanna, urban open spaces and in cultivated areas. 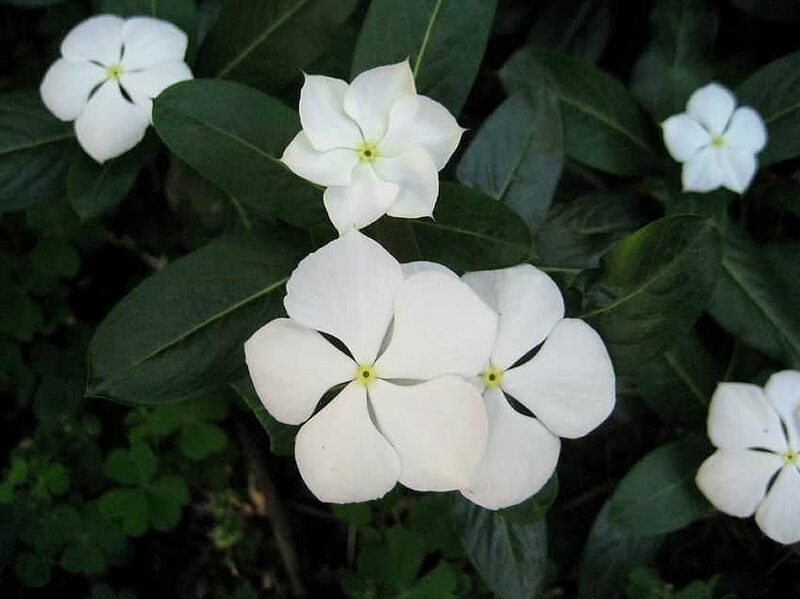 Description: Catharanthus roseus is a small, upright shrub prized for its shiny green leaves and delicate looking flowers. The glossy oval leaves are 2-5cm (0.8-2 inch) long, have a white centre vein and are borne in opposite pairs on slender stems. One or more flowers are produced at the stem tips throughout a flowering period that generally lasts from mid-spring to early autumn. Each flower has a 1cm (0.4 inch) long tube flattened out into five lance-shaped petals at the month, which is up to 4cm (1.5 inch) wide. Flower colour is usually soft rose-pink or occasionally, mauve. These plants may self-seed in optimum growing conditions. 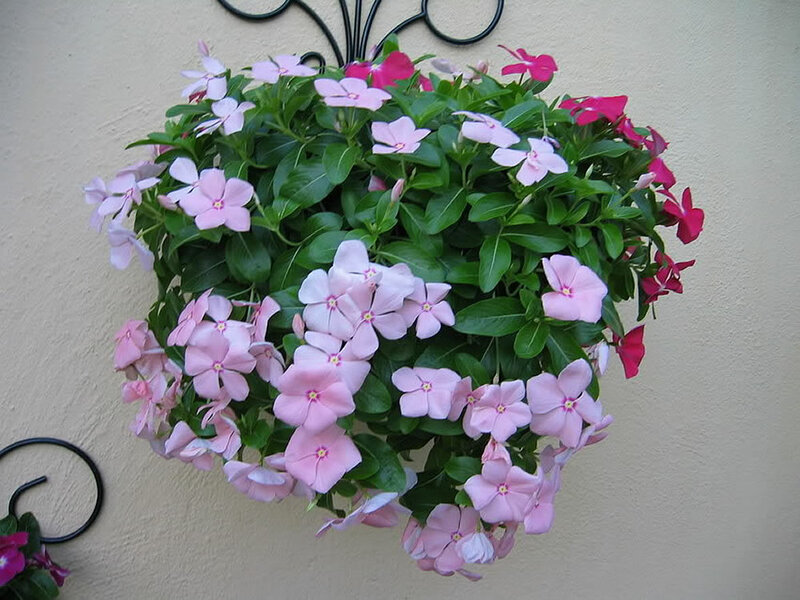 Houseplant care: Catharanthus roseus plants are usually acquired in early spring and discarded when the flowering season has ended. They are not normally worth overwintering because only young plants tend to look healthy and flower profusely when grown indoors. Pinch it back early in the season to encourage branching and a fuller plant. Light: Bright light, included three or four hours of direct sunlight daily, is essential for good flowering. Temperature: Normal room temperatures are suitable at all times. Catharanthus roseus cannot tolerate temperatures that fall below about 10°C (50°F). Watering: Water the potting mixture plentifully, but do not allow the pot to stand in water. Feeding: Once flowering has begun, apply standard liquid fertiliser every tow weeks. These plants are not tolerant of excessive fertiliser. Potting and repotting: Use soil based potting mixture when repotting these plants. Move them into pots one size larger every six to eight weeks. Probable maximum size needed is 10-13cm (4-5 inch). Gardening: Catharanthus roseus is a tender plant and does not withstand frosts. It is best grown indoors in temperate climates. 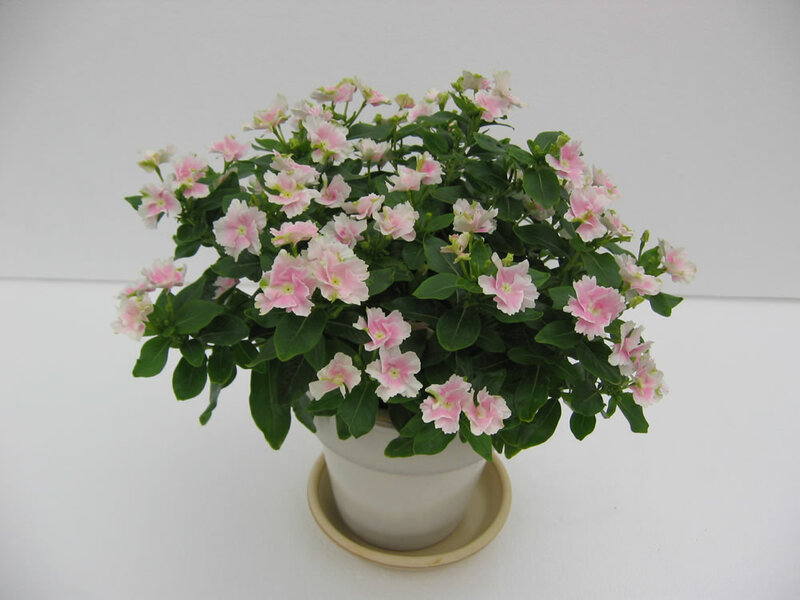 It thrives well in hot and humid environments, but it tolerates the hot temperatures in summer and it is also able to bear the extremes of drought and heavy rainfall. In frostfree climates it develops a woody stem near the base and can get 0.6-1m (2-3 feet) tall and spread out just as wide. As annuals, they are usually smaller and more prostrate. Pinch back early in the season to encourage branching and a fuller plant. The flowers drop off when they finish blooming, so no deadheading cleaning is needed. 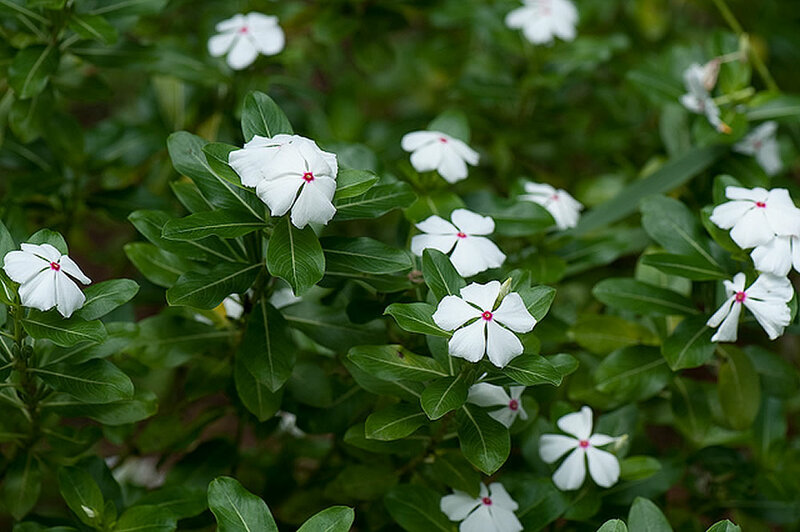 Position: Catharanthus roseus should be planted in full sun or partial shade to promote flowers all year round in hot climates. They do best with some shade during at least some of the day during summer. They start to look a little frazzled by the end of the day without some shade and tend to get somewhat leggy when they get a lot of sun. A shady spot will promote lush foliage, but part sun seems to be their favorite spot, to obtain good foliage and plenty of blooms. 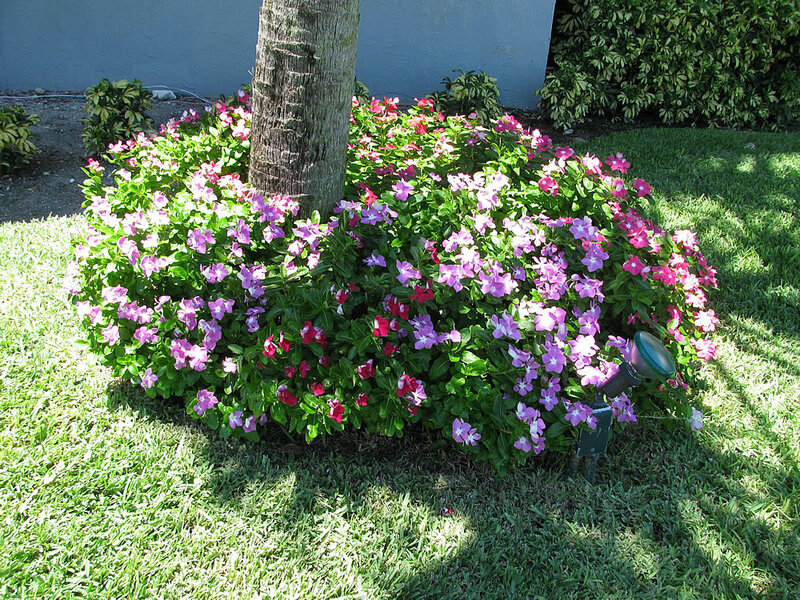 Soil: Catharanthus roseus plants are best grown as annual bedding plants in well-drained sandy loams. Superior soil drainage is the key to growing this annual well. Flowering will suffer if soils are too fertile. The planting distance should be about 30cm (12 inch) between plants. Irrigation: They need regular moisture, but avoid overhead watering. Catharanthus roseus plants should be watered moderately during the growing season, but it is relatively drought resistant once established. They will recover after a good watering. Fertilising: Catharanthus roseus plants are not heavy feeders. If necessary, feed fortnightly or once monthly with a balanced liquid fertilizer. Too much fertilizing will produce luxuriant foliage instead of more blooms. Propagation: Catharanthus roseus can be propagated from tip cuttings as well as from seed, since plants grown this way will flower more profusely. Take a 5-8cm (2-3 inch) long tip cuttings of new growth in late spring or summer. Trim each cutting immediately below a leaf, dip the cut end in hormone rooting powder and plant it in 5 or 8cm (2-3 inch) pot containing a moistened well drained potting mixture. Enclose the whole in a plastic bag or propagating case and stand it in bright filtered light. After rooting occurs (generally in three to four weeks), treat the rooted cutting as a mature plant. In late winter or early spring, sow a few seeds in a shallow tray of moistened rooting mixture, place the tray in a plastic bag or propagating case and stand it in warm position where it will get bright filtered light. When the seeds have germinated – in two to three weeks – uncover the tray and begin watering the seedlings moderately – enough to make the potting mixture moist, but allowing the top 1cm (0.4 inch) to dry out between waterings – until they are about 1cm (0.4 inch) high. 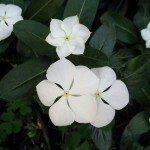 Transfer each seedling into an 8cm (3 inch) pot of potting mixture and treat it as mature Catharanthus roseus. Outdoors, it will reseed itself if the soil is loose. Stem rot, leaf spot and aster yellows may occur. Treatment: Avoid overwatering and soggy conditions. Use suitable fungicide to treat these diseases. Watch for slugs and snails. Treatment: These pests are controlled using an appropriate molluscicide, both pellet and liquid forms or by hand pick at regular inspections. Catharanthus roseus cv. ‘Albus’ is a white-flowered form. Catharanthus roseus cv. ‘Ocellatus’ has white flowers with a brilliant, carmine-red centre. 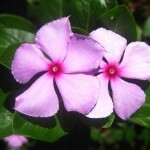 Toxicity: Catharanthus roseus is poisonous if ingested or smoked. It has caused poisoning in grazing animals. Even under a doctor’s supervision for cancer treatment, products from this plant produce undesirable side effects. Uses and display: Catharanthus roseus makes excellent bedding or border plant for summertime annual or perennial garden. 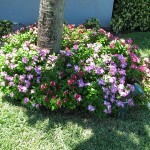 It is great as a ground cover, planted en masse with different colours or in mixed plantings. 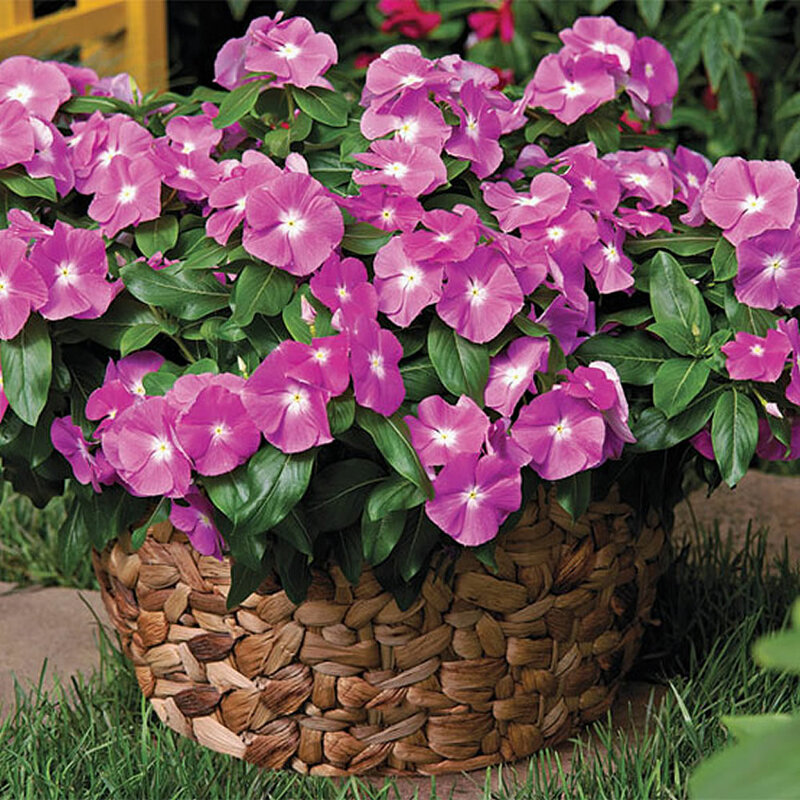 It is perfect for raised planters, containers or hanging baskets to display its colorful beauty at decks, patios, garden porches, windowsills and balconies. This plant is attractive to butterflies too. 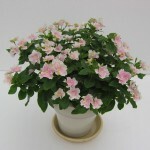 Certain varieties can be grown as a houseplant in a brightly lit location. Cut branches can be used as vase arrangement in homes. 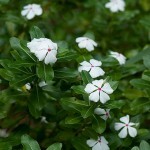 Catharanthus roseus is grown commercially in the pharmaceutical industry.